I was speaking with a friend of mine recently about how investment opportunities come and go, how they literally do a slow dance right under our noses but we fail to recognize them until it’s too late. In fact, almost every investment opportunity seems that way with 20/20 hindsight but while it’s upon us, strange that we are as humans, we fail to recognize these opportunities, let alone capitalize on them. And in some cases, we recognize them but have some excuse for not heeding logic. So, we naturally started wondering what might be dancing under our noses right now that we are completely oblivious to. The most obvious seemed to be the “low” interest rates. Our federal tax code lets you legally deduct certain expenses from your income and exempts you from paying taxes on that portion. Such exemptions include pre-tax contributions to your retirement savings accounts, out-of-pocket spending on everyday health- and dependent care using something called a Flexible Spending Account or FSA, the cost of going from one workplace to another or from your home to a temporary workplace, and so on. These savings add up nicely, month on month. Say you pay 30% of your net income in taxes each year. Now, if you set aside $500 for qualified expenses, you pay no tax on this money – that’s like not paying $150 to the government and using that money instead for necessary expenses. That’s pretty nifty, yet many ignore this. It’s like buying something at Macy’s and not using that “30% off” coupon in your wallet – just doesn’t make sense. So please… use your government-issued 30% off coupon wherever you can! Mortgage rates are at an all time low so this is a great time to see if you qualify for a lower rate that could save you considerable sums of money each month. To check this out myself, I went to bankrate.com and used their mortgage rate trend tracker to see how rates have changed nationwide over the past five years on a 30-year fixed mortgage (see graph below). Their calculator is pretty cool and easy to use, and it reminded me that rates were in the 6% range in 2007 and are now down to about 3.65% – that’s quite a drop! So when should you think about re-financing? The general rule of thumb is that mortgage refinancing makes sense only if you can knock off at least half-a-percentage point. 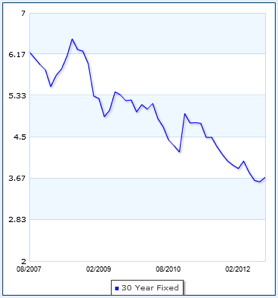 So with 30-year fixed rates currently at 3.65%, those of you paying more than 4.15% might want to look into refinancing. And while it is tempting to wait and see if rates go lower, please don’t wait – rates might go lower but most economists believe there is little room left for a further significant drop. So act now! Also remember, like most things, it’s very hard to time the highs and lows, so get in when something seems reasonable enough, don’t try and overly finesse your trades because chances are the market will get the better of you. Credit card debt is always quite steep – it averages around 15%, and more for those who routinely rack up credit card debt. And chances are you’re definitely paying way more interest on your credit card than you’re making on any of your stock, bond or other investments. Credit card debt also accumulates rather quickly if you only pay the minimum balance because you then accumulate interest on outstanding interest, over and above the interest on the amount you spent. So, one of your smartest money moves now is to pay down credit card debt as soon as possible, even if that means taking money away from your stock or bond investments. You should also look into lowering your interest rate by speaking to your credit card company or by taking advantage of balance transfer offers. Even the smallest decrease can add up to a lot in savings. It’s past tax season and lots of folks recently received refund checks in the mail, much to their unfettered delight. But, if they were smart, they would not have received refund checks and would have instead, perhaps, paid the government a small amount in taxes owed at year end. See, increasing your tax withholding is sort of like this. You need to pay me $70 each month – January to December ($840 in a year). Instead, you voluntarily pay me $100 each month ($1,200 in a year) and are then delighted when I give back your $360 without interest around June or July of the following year. Doesn’t make sense, right? Yet millions of hardworking Americans do just that every year. They have far more withheld from their paychecks each month than they fairly owe the government in taxes. Then, sometime in the New Year, they file their taxes and are mighty happy when they get their refund check a few weeks or months later. What they’re missing is that this was their money all along, to spend or invest, which they voluntarily sent to the government instead. Another note of caution here – make sure you don’t deduct too little because you could then run the risk of overspending this money and not having enough to pay the extra amount you still owe in taxes. According to Bankrate.com, only about 25% of us have enough stashed away for a rainy day – for serious emergencies such as a lost job, a flooded home, etc. What’s enough for an emergency fund? Experts say you should stash away and have quick and easy access to about six months of your average monthly expenses, with the rest socked away in diversified investments. And you can easily do this by filling out a form that allows your employer to automatically deduct a set amount from each paycheck and re-route it to your savings or checking account. That way, you will not have access to this money, will learn to live within your reduced means, and will increase your net worth over time. Think of this as a small sacrifice and a delayed gratification that gives you greater rewards down the road. So those were five smart money saving tips, generously shared with us by our friends at bankrate.com. Each of these steps can save you a lot, and when you add them all up, these five simple steps could put you squarely on track for a richer financial present and future. 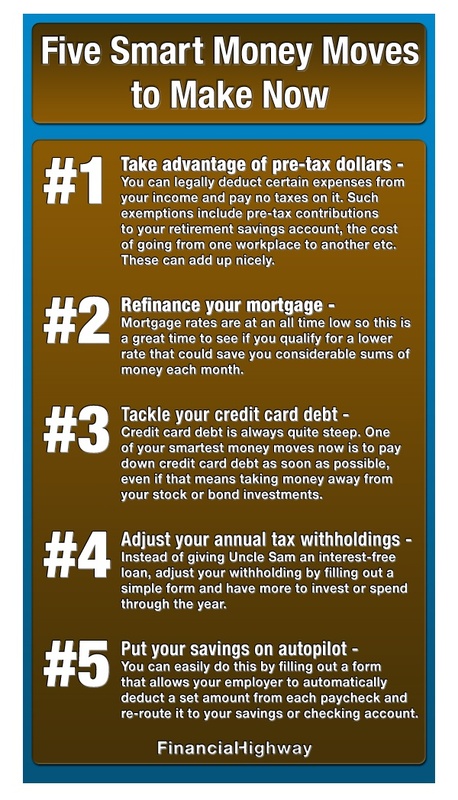 I defiantly agree with number 2 refinancing your home loan. I’m in the process of building a new house and I’m looking at getting a 3.5% interest rate on my home. I would have never thought in a million years rates would be this low. In fact, back in 2009 when I refinanced my home I got a 6% rate at that time and thought that was good. If people don’t grab up these low rates it’s their own fault. Great ideas. But I’ve found #4 to work the very opposite for us. Call it psychology or stupidity, but we’ve found it far more effective to have tax withheld at the maximum rate (single zero) and get a refund every year. That is our emergency fund, and only if there’s more than 3 months’ expenses in it do we buy stuff like appliances, TVs, etc. The interest you lose is minimal, but the benefit of getting it as a lump sum is great. Sure, we can do it ourselves, but that’s work and Uncle Sam does it for free. It’s also a great incentive to file early and miss the rush. And we sleep easy knowing there’s a cushion for any nasty surprise (such as E-Trade telling the government and us different things about our dividends). While all the other tips are great, I think tackling credit card debt should be at the top of the list for smart money management. It makes up most of the debt of thousands of households across the country, and also puts a lot of additional debt on the borrower’s shoulders; think interest rates, late fees, and other penalties and peripheral charges. One good way of ensuring that you shell out less cash and clear up as much of your debts to the credit card companies is paying as much as you can off what you owe before the due date. An even better way to resolve credit debt (and other debts) would be to do the aforementioned – early payments, et al – with a good debt consolidation plan. You’ll get lower interest rates and a lot of other perks while obtaining the convenience of paying a single sum for multiple debts as opposed to a number of payments to various creditors. Please consult with an investment professional before you invest your money. This site is for entertainment purposes only - any opinion here should not be treated as an investment advice. We are not liable for any losses suffered by any party because of recommendations published on this blog. Past performance is not a guarantee of future performance.